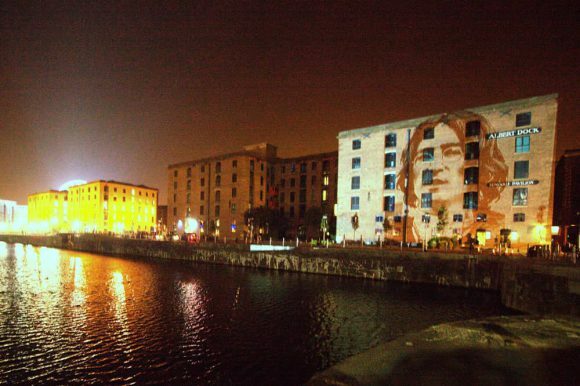 A photograph of John Lennon is being projected onto Albert Dock in Liverpool to mark the start of the John Lennon Tribute Season. The photograph of Lennon, taken by Bill Zygmant, will illuminate the Albert Dock from 9-23 October 2010, and is a joint initiative by the Albert Dock Tenants Business Association, Liverpool City Council, Hard Day's Night Hotel and the Beatles Story exhibition. Bill Zygmant began his career at the London Star, and in 1962 joined a Fleet Street picture agency. From 1964 he was a freelance photographer, and took pictures of music and show business stars including The Beatles, Bee Gees, Jimi Hendrix, Marc Bolan and Mary Hopkin. It is incredible to see my work projected onto one of Liverpool's most iconic buildings in celebration of the life of John Lennon. His legacy and his music continue live on in the city and this is a fitting tribute – I'm sure he would have loved it. The Hard Day's Night Hotel in Liverpool has renamed a suite the Sygmant Suite in his honour. Two of his images are displayed in the Lennon Suite. Zygmant's website is billzygmant.co.uk.